I've recently mentioned that I'd be posting a summer house tour soon, and I'm afraid I over-shot that a bit. Consider this more of a "here's a few summer decorations I put out" post. 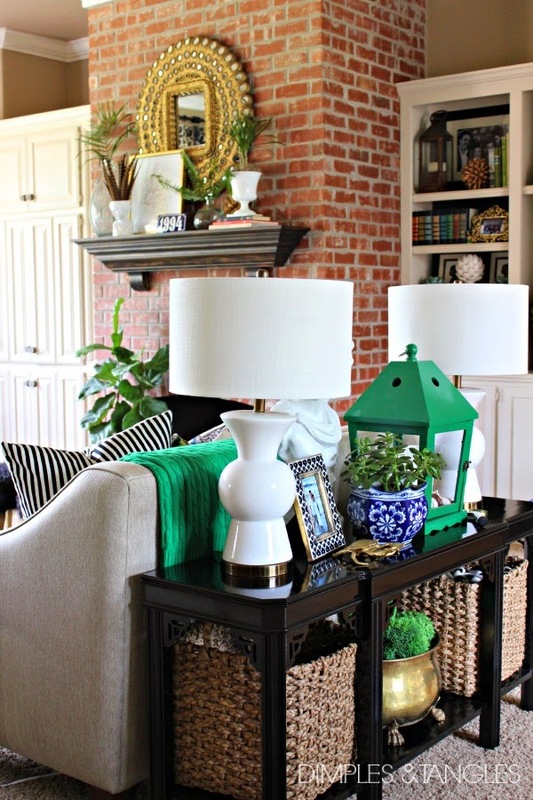 :) Since summer is well on it's way, I focused on the living room and entry and called it a day. For the entry, I left the giant clam shell but removed the orchid arrangement and added a live fern. 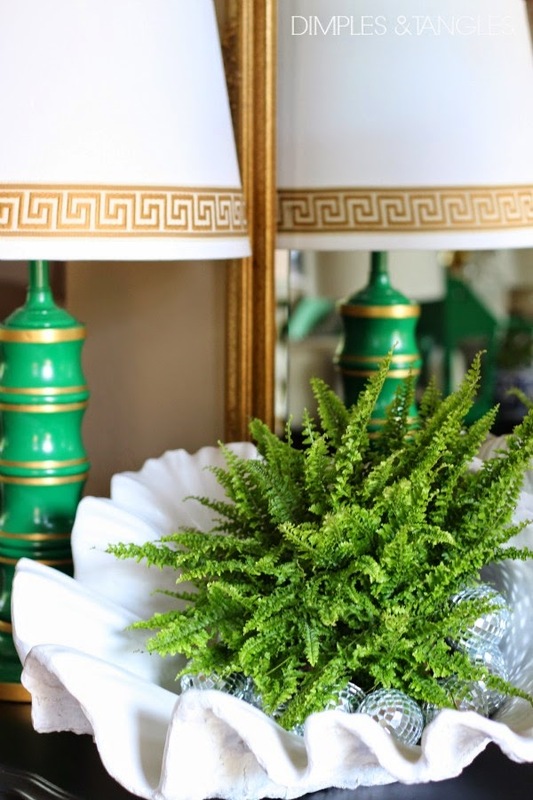 I'm certain that this is my favorite summer vignette ever...natural, simple, shiny, and green. 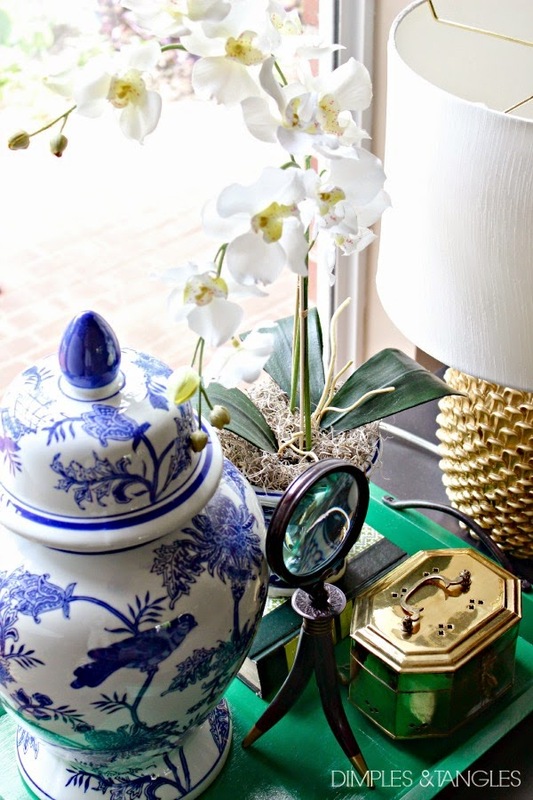 Moving on to the new sofa table, a few weeks ago I showed you 3 ways that I styled it, but here's where the accessories have landed for summer. My instagram friends saw my new purchase a few weeks ago, but here is my new loveseat in it's home! I sold the big red chair to a sweet reader for her vacation home, and came across this one at Dillard's for a steal. I love the lines, and the pillows are hiding a few tufts in the back. Now let's just talk about those pillows for a minute... my sewing machine was humming last weekend as I made a few new sets for summer. I've had the spotted Togo fabric for probably a year and made some stockings out of it at Christmas, but that left me without enough for the pillow backs. So, I used a stripe on the back. Turned out ok by me! **Sneak peek at a looming project in the background...we hope to tackle the ceiling first this weekend! I also made a pair of these pretties thanks to a little help from my friends. Bethany taught me how to use my sewing machine to do monograms, and Emily found this fabulous fabric and shared the source with me. It's metallic DENIM, and it's off the bolt at Hancock's! It's slightly stretchy and such a nice weight. You MUST see how Emily used it in her home for the backs of the shelves in her Butler's Pantry...gorgeous! 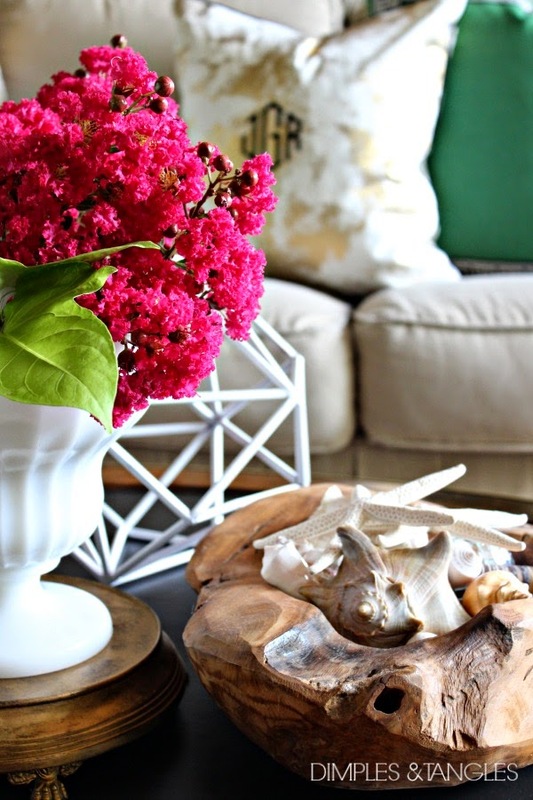 Ok, pillow rant is over, but I'm loving how that simple change lightened things up for summer. I made an excellent Craigslist purchase a few weeks ago, and this table was included in the deal. I wasn't super excited about it until I realized how perfect it would be for this spot in the corner between the couch and the loveseat. Plus, I really liked the details once I got a good look at it. 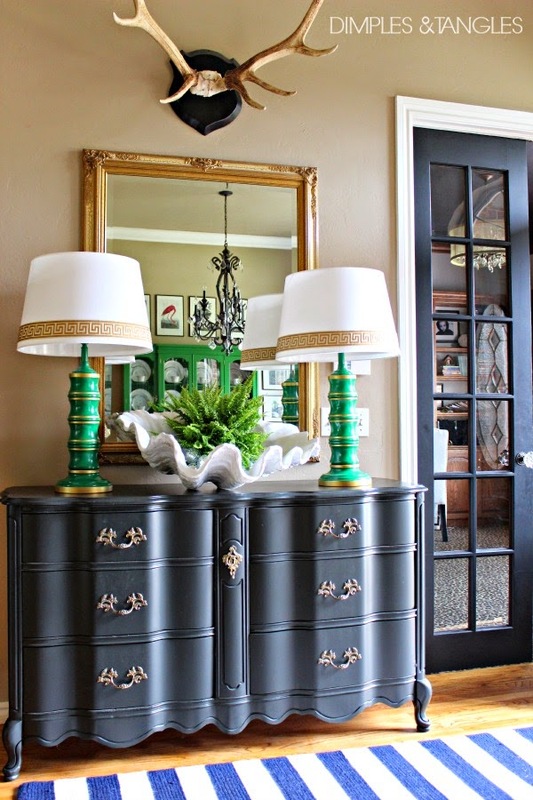 The black dresser doesn't have anything specifically for summer, but I'm loving this green tray here with the blue and white pieces and a touch of brass. You can see my brightened-up peacock mirror, a small lady-vase that I picked up 80% off at Hobby Lobby recently (she was turquoise but some glossy white paint fixed that), and I couldn't resist another Lindsay Letters piece from Hobby Lobby. So that's it! Just a few simple changes, clipping some outdoor greens, shopping the house and moving some things around, and we're all summer-ized. Lastly, I'd like to thank Crane and Canopy for inviting me to design a room featuring their fabulous bedding. This was my first time for a project like this, and it was so much fun! You can see what I came up with here. Don't be surprised if you see something similar around here in the future! And, many thanks to Heather from Southern State of Mind for inviting me over to her blog yesterday for a little Q&A in her "At Home With..." series. It's been so fun participating in her Summer Style Soiree series this summer, and I enjoyed visiting while she settles in with her darling new baby. Thanks Heather! Whew! That post turned out to be way longer than I anticipated. If you made it to this point, thanks! Remember, see you here Friday for July's Best of the Nest Party! I just love your color scheme - the blue and green is fresh! My great-grandmother had a brass incense box like the one you have on the dresser. Seeing that brought back so many wonderful memories! I wonder what ever happened to that little box, I would love to have it. STUNNING Jennifer!! I love every single detail!! 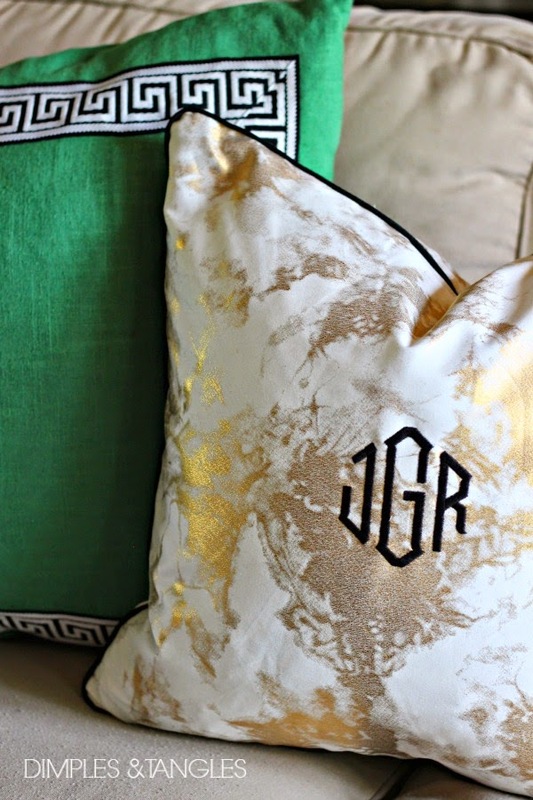 That metallic demon + monogram pillow is fantastic. I read every post of yours but don't often pause to comment. 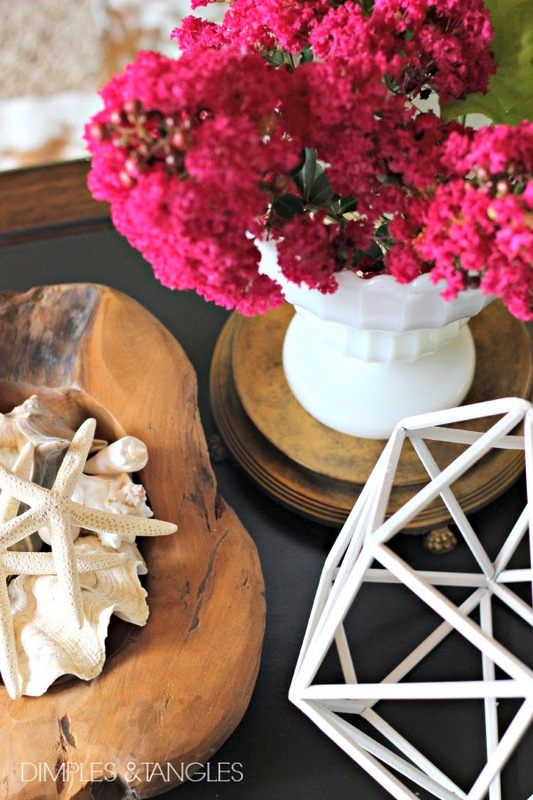 Your blog has easily become one of my favourite home decor blogs, so inspiring and genuine. Thanks for sharing your work with the world. Oh, thank you Dominique! Your sweet comment was a blessing to me this morning! Beautiful! I just picked up the Wisteria clam shell for a good price. 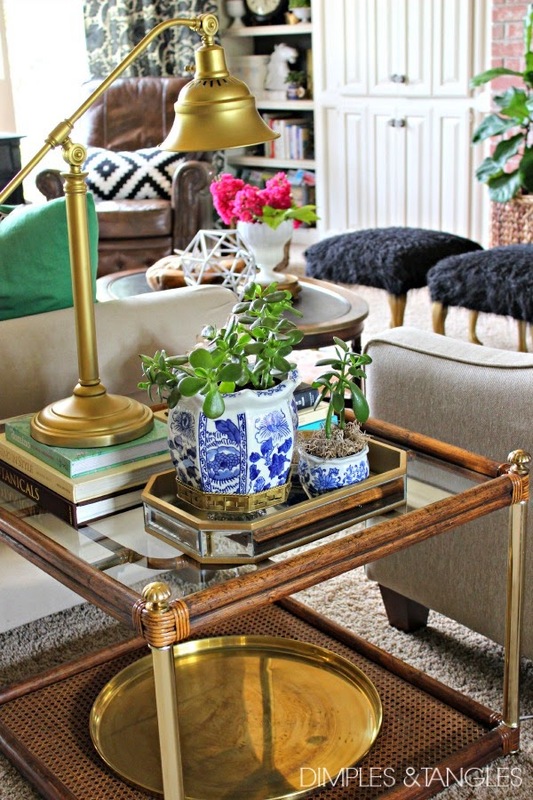 Love the addition of the fern. No worries. I pretty much overshot my whole summer! :) The house looks great!! Everything is so beautiful. 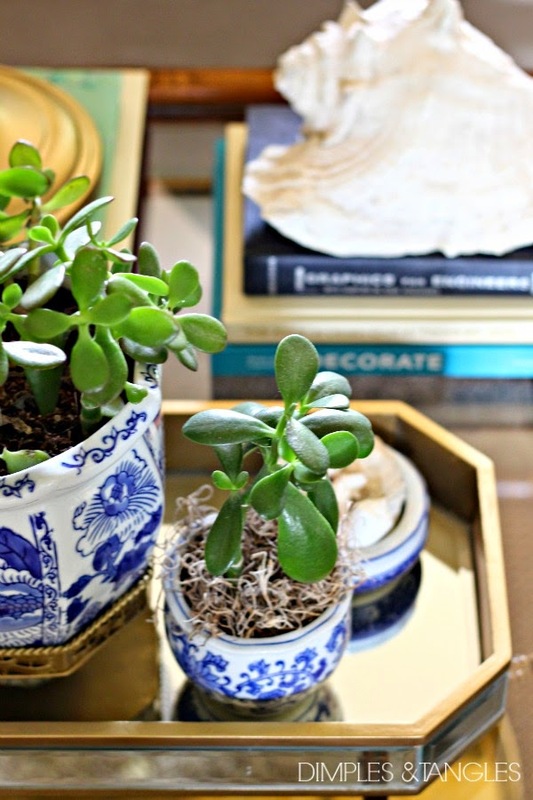 I love how you create such interesting and beautiful vignettes. Gorgeous. Everything looks fresh and fabulous switched up a tad! 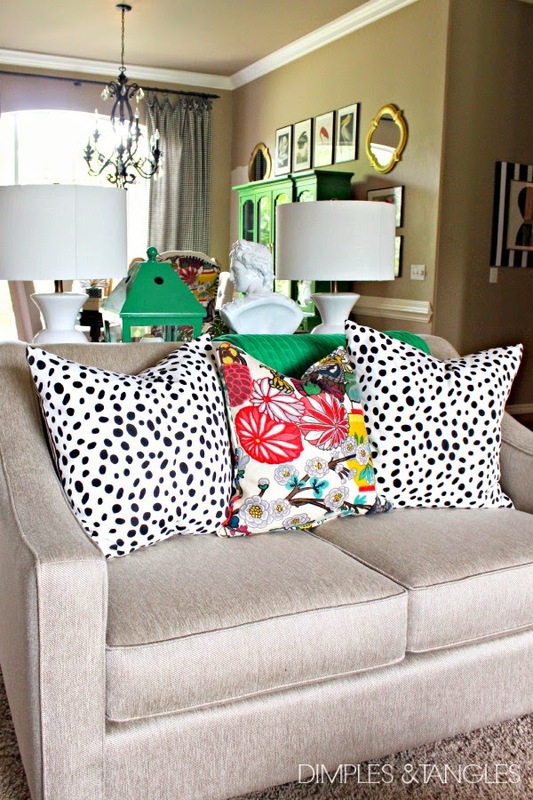 Your new love seat and pillows are such a fun addition, too! Lovely, my friend! Loving what you have done its crisp and eclectic!! Great! Just when I think I can't love your house more, you change it up and I do :) Love the new pillows and loveseat!! I especially love the crab and that metallic monogrammed pillow is FAB!!! Great job as always! Wow, I love your decorating style. I am fairly new to your blog and am so enjoying it. 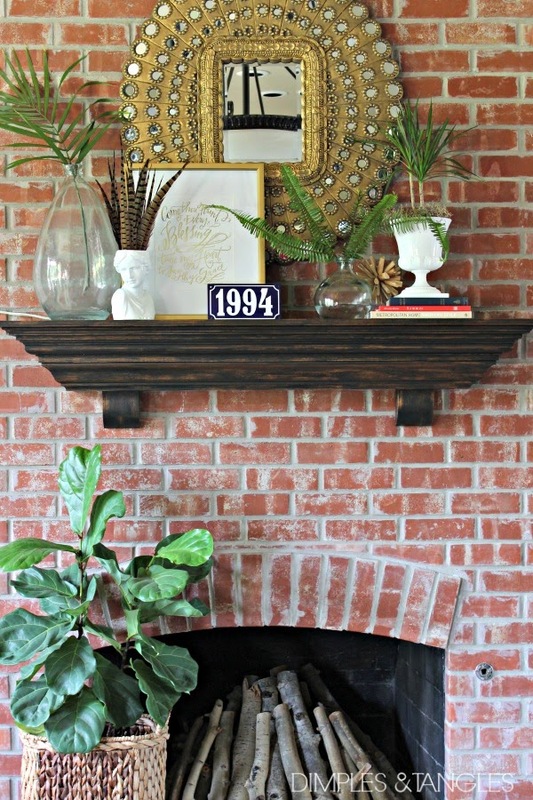 With that being said, please excuse this question if you have addressed this DIY before: When you chalkboard silver plates or your silver plate wreath above your mantle that was shown in your disco ball Christmas link did you use real silver plates or throw away ones from the party store. I love the look..
Hi Debbie, Thanks! Glad you're finding some things you like! Those are all metal platters from Dollar Tree. Inexpensive investment! 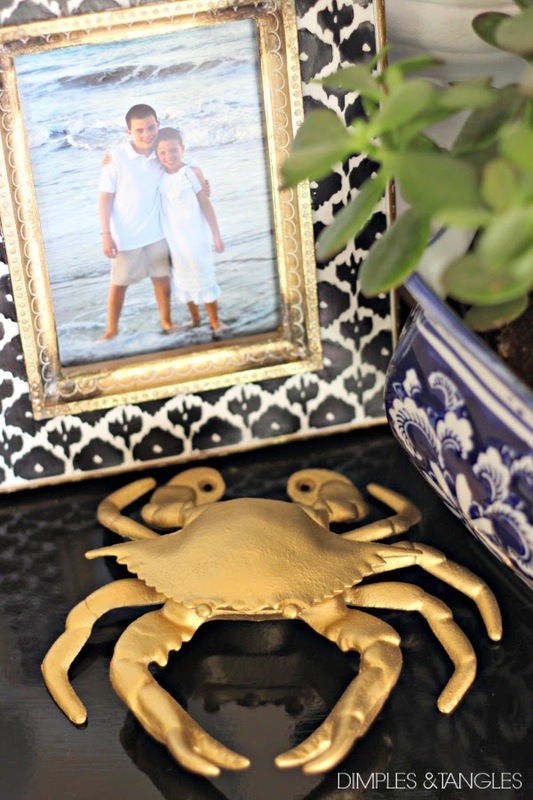 How cute is that little gold crab! Even is he's wounded... Everything looks just stunning! I don't know where to start- this is all FABULOUS!!! Beautiful work! 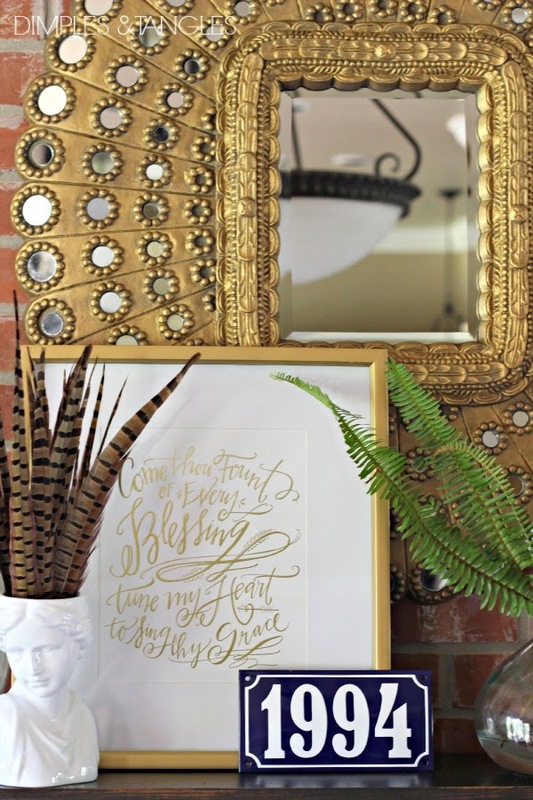 I have that same Lindsay Letters print from Hobby Lobby and brass crab! We are twins :) Love all your fun touches for summer. 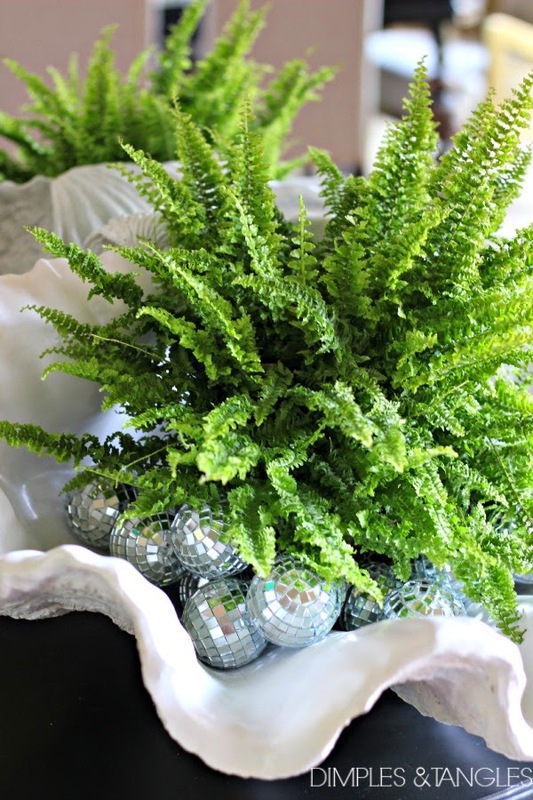 The disco balls and the fern are my favorite part too! I always love your house, you know how to use color perfectly! 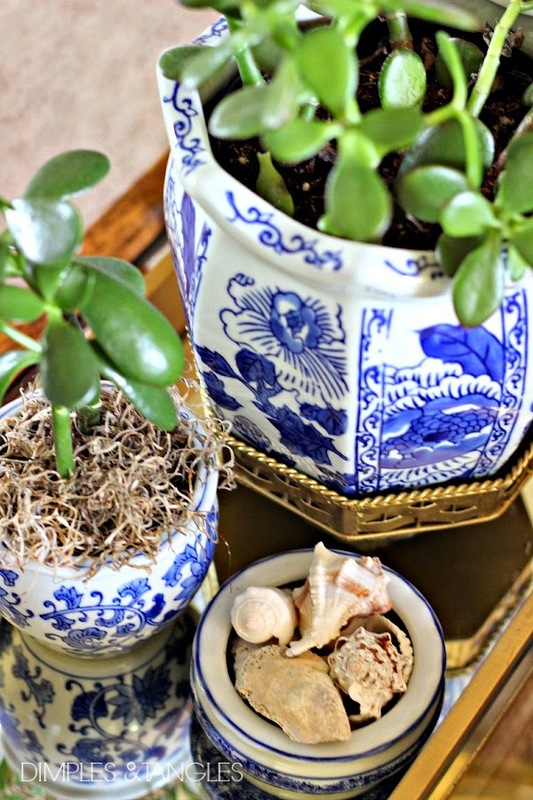 I'm always inspired to do something in my own home after looking at your blog! Can you tell me where the black and white pillow is from? It's the one sitting in the brown leather chair. I need one of those for my daughter's room. Thanks so much! Hi Angela, thank you so much! Those pillows are from Ikea. The cover is purchased separately than the pillow insert inside. It's a popular item, hope you find one! Wow! That is one amazing mini house tour. Your home looks absolutely gorgeous. 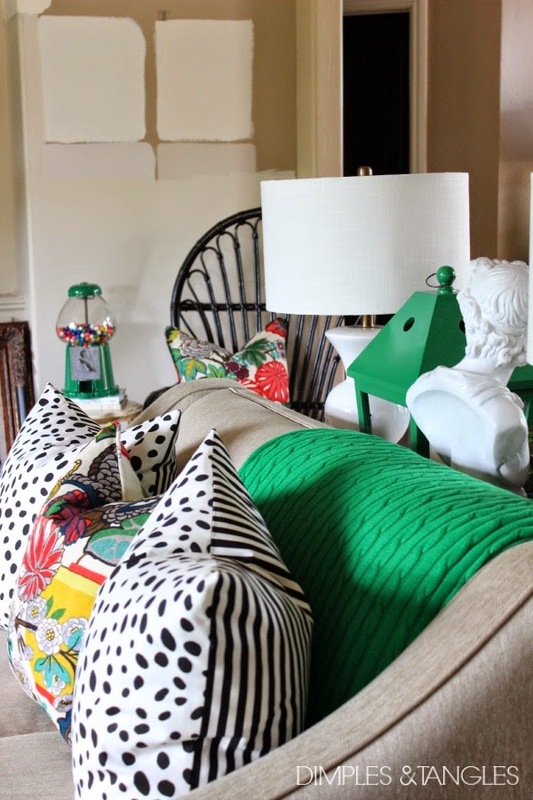 I'm loving all the decor pieces and the colors, especially those rad prints for the pillowcases. Thank you for sharing such lovely pictures of your home! Wishing you all the best with all your future projects!